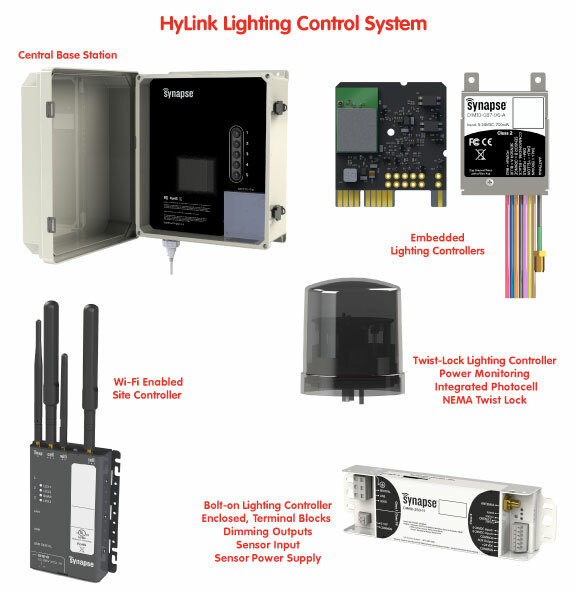 HyLink is a Wireless Lighting Control Solution that enables considerable Energy Savings and Lowers Operating Costs by Automating, Customizing and Controlling the Behavior of Lights. Built for Easy Installation and Use, HyLink Doesn’t require Internet Access and can Scale to Hundreds of Lights, all Controlled by a Single Site Controller. 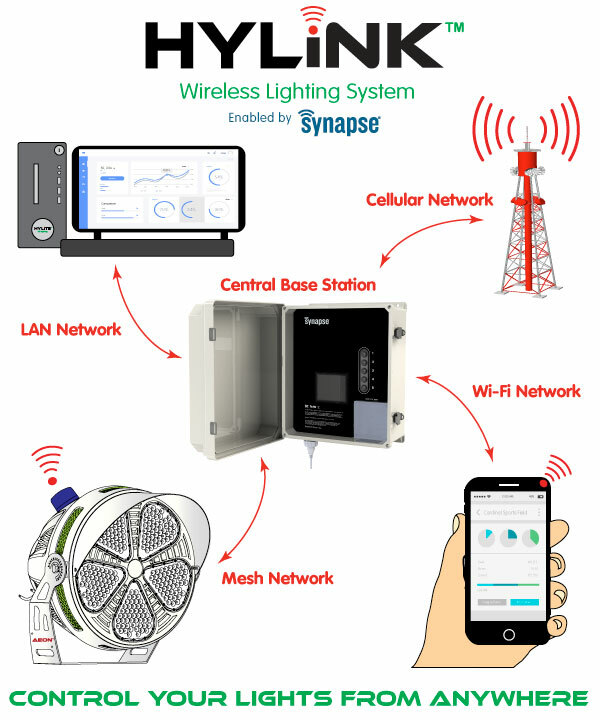 HyLink is powered by an Encrypted, Self-Forming, Self-Healing, SNAP Mesh Network and provides a Reliable and Secure Foundation for your Lighting Network. HyLink makes Commissioning easy with various provisioning options. In addition to Manual Entry and CSV Upload, the HyLink Mobile Commissioning Application and Auto-Discovery of Unconfigured Lights makes Commissioning very Easy and Intuitive to use. Day-to-day Operation is also a breeze thanks to a Browser-Based User Interface that’s accessed through a Mobile-Friendly WiFi Interface. Easy access from a Laptop, Tablet or a Smartphone means your System can be Controlled or Reconfigured whenever needed. With the optional HyLink Remote Access service, your Lighting Network can also be Managed Remotely from anywhere you have an Internet Connection. The system stores Power Data, Alarms, and Critical Events Locally for Maintenance and Troubleshooting and provides California Title 24 Compliant Daily Schedules. Occupancy and Ambient Light Sensor Integration allows Full Lighting Network Customization under a Variety of Situations and Applications with Programmable Schedules and Easy Setup, HyLink is the Perfect Solution for Lighting Control...Simply Configure it and Let it Run. Works both Indoors and Outdoors - No Need for Separate Control Systems. Design your System with a Full Range of Product Offerings. Specify a Simple Solution or a Fully Integrated Lighting Management System. 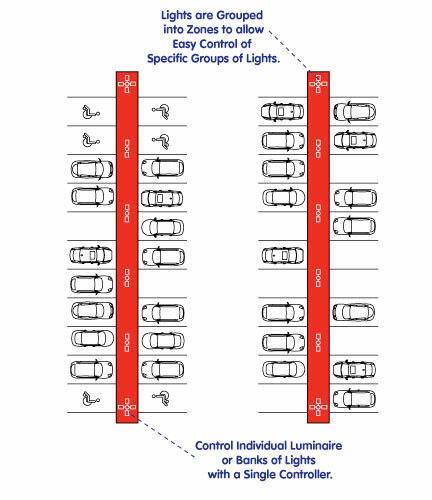 Combine Individual Luminaire Control & Area Control. 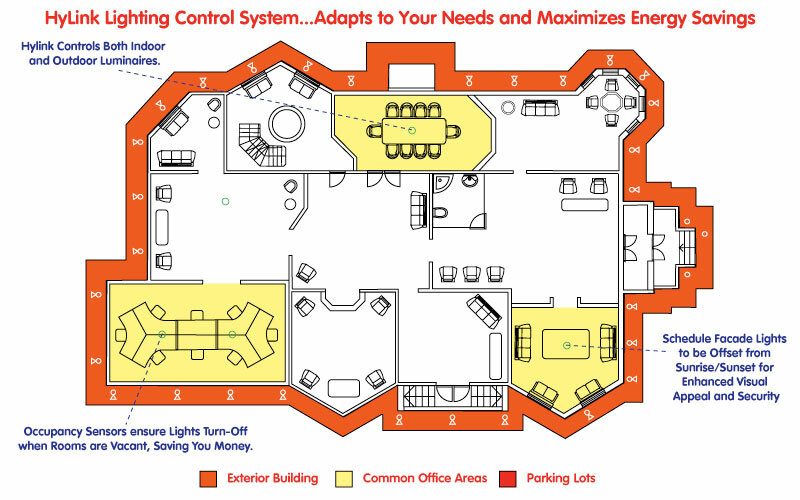 HyLink Wireless Lighting Control System allows for Limitless Flexibility and Customization. No Special Server Required - Forget Expensive, Complex Hardware. Mobile Application based Commissioning and Control. Site Based Control. Functions with and without an active Internet Connection. Flexible Control Solutions - Control Individual Luminaire or groups of Luminaires, anywhere from ON/OFF Control, 0-10V Dimming or any Combination to a Wireless, Fully Scheduled System based on Automated Schedules or Events. Detection of Uncommisioned Controllers. Setup is a Breeze. Wireless makes Installation Faster. Drastically reduce Labor and Risk for Every Project. Automatic Software Upgrades via Encrypted Over-the-Air Communications. Task Tuning: Put light where you need it, when you need it!